Tikha gathiya recipe – This is popular Gujarati snack recipe. 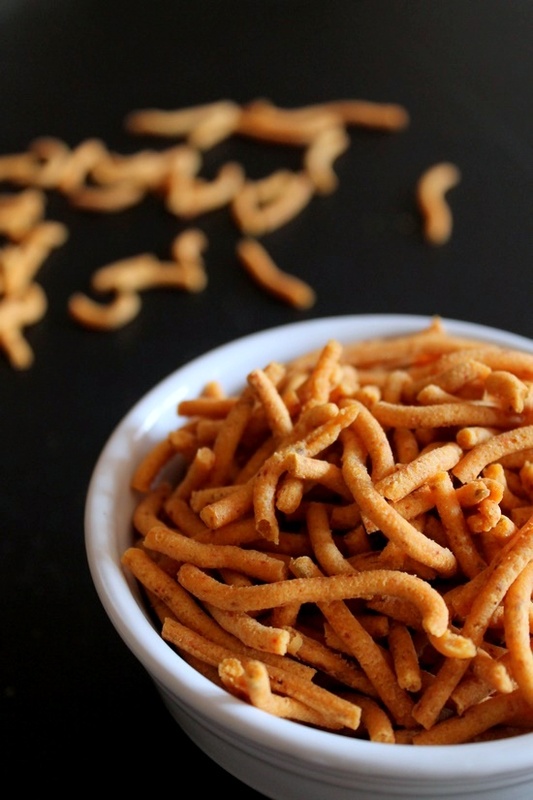 Crunchy, spicy thick sev made from besan and spiced with red chili powder. 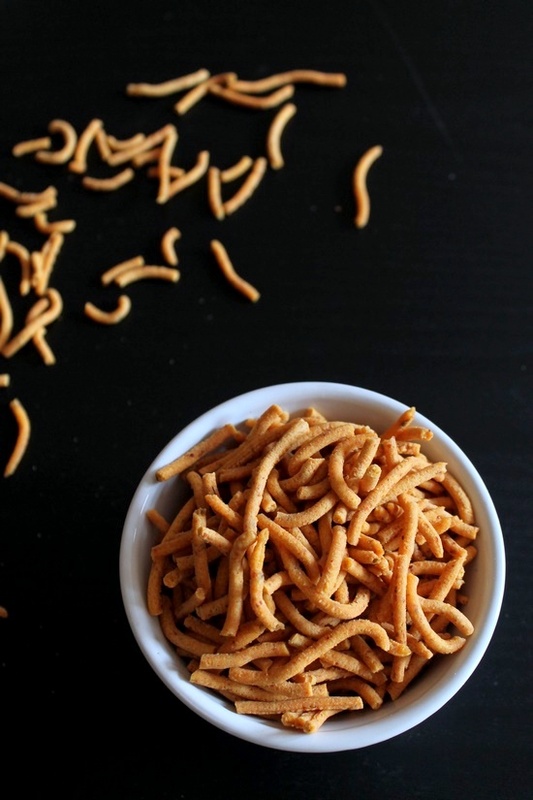 There are many different varieties of gathiya like papdi gathiya, fafda gathiya, tam tam gathiya, bhavnagri gathiya, tikha gathiya, methi gathiya. All these varieties are available in farsan shop. Few of them you can make at home easily. But for few types, you need special skills or equipements. So I have never tried to attempt those at home. Coming back to this tikha gathiya, this type don’t taste good if served warm. You must let it cool down completely. As it cools it becomes crispy and crunchy. Then you can enjoy it as a snack with cup of tea or coffee. My mother-in-law makes this tikha gathiya very often. She make a big batch and store in a dabba. and dad-in-law will have it with a cup of tea every morning for next few weeks. This is kind of heaven for him. the procedure of making is same as plain sev recipe. The difference is in the recipe – few spices are added here to make this spicy aka tikha. And these are made in thick form unlike plain sev. 1) Take besan, salt, ajwain, red chili powder and turmeric powder in a bowl. Mix well. 2) Add hot oil. roughly mix it using spoon. 3) Now add little water at a time and make medium soft dough. It can be sticky, so I started with spoon. At the end, I have oiled my hand and then knead into smooth dough (do not have pic of smooth dough, but you will see in the later pic). Make sure it is not too soft, or not too tight or stiff. 4) Now take the sev maker machine, choose the disc which has bigger holes for thick sev. 5) Now heat the oil in a pan on medium heat for deep frying. While oil is getting hot, take smooth dough and add into the sev machine and close it tightly. 6) As you twist the handle, you will see the gathiya coming out from the bottom. 7) Now check the oil. drop a small piece of dough in the oil, it should come on top steadily. Meaning oil is ready for frying. If the piece of dough comes on top immediately then oil is too hot. if the piece of dough take too long time come on top then oil is not hot enough. 8) Now hold the machine using one hand, turn the handle using another hand. gathiya will come out and drop into the oil. As it falls into the oil, use the first hand as a guide and move the machine in circular motion. 9) As you complete the one circle, stop there and turn the handle in opposite direction to stop gathiya from coming out. As I was taking photo and making the sev, I was not able to form a circle, but that is not an issue. The bottom line is you need to make sure that gathiya is not dropping on top of each other, little overlapping is fine. 10) Halfway through flip it and fry both the sides, till it gets crispy. You will also notice that oil will stop bubbling as well. 11) Remove it using slotted spatula and put them paper towel lined plate. Repeat the same till you finish all the dough. 12) Let the sev cool down completely. Then crush between your palm to make bite size pieces. 13) Then you can serve. Or store them in airtight dabba or container for 2-3 weeks or more. Serving suggestion: It can be served as morning/evening snack with cup of tea/coffee. It can be served with fried chili and papaya sambharo. Take besan, salt, ajwain, red chili powder and turmeric powder in a bowl. Mix well. Add hot oil. roughly mix it using spoon. Now add little water at a time and make medium soft dough. It can be sticky. Make sure it is not too soft, or not too tight or stiff. Now take the sev maker machine, choose the disc which has bigger holes for thick sev. grease the inside of the machine with little oil. Now heat the oil in a pan on medium heat for deep frying. While oil is getting hot, take smooth dough and add into the sev machine and close it tightly. As you twist the handle, you will see the gathiya coming out from the bottom. Once oil is hot, hold the machine using one hand, turn the handle using another hand. gathiya will come out and drop into the oil. As it falls into the oil, use the first hand as a guide and move the machine in circular motion. As you complete the one circle, stop there and turn the handle in opposite direction to stop gathiya from coming out. Halfway through flip it and fry both the sides, till it gets crispy. You will also notice that oil will stop bubbling as well. Remove it using slotted spatula and put them paper towel lined plate. Repeat the same till you finish all the dough. Let the sev cool down completely. Then crush between your palm to make bite size pieces. Where is the spicyness in this???? No ingredients for spicy – just salt, ajwain, turmeric. I forgot to add red chili powder in the ingredients list.